We all know this: the internet is an enlightening, informative resource. Except when it infuriatingly isn’t, of course. A good number of collectible, obscure, or just plain peculiar books come across our counter at Bibliohead, and while we use this wide web to sell some of our books online, we also use it to find out more about them (especially those peculiar ones): How rare is this book? What about this particular edition of it? Are some editions worth more than others? Has anybody else even seen a copy of this self-published comic that is so bizarrely hilarious and almost nonexistent online that you almost want to keep it all for yourself and not bother figuring out what it’s worth? Some esoteric aberrations are the sole foundation for identifying the collectability of a book; typos, for example, are frequently the means by which a true first edition, first printing is differentiated from later printings that appear to be firsts in all other respects — and as you can imagine, the internet is a great place for finding out that if the 9th line of page 47 begins “the bnad” instead of “the band,” then you have something exceedingly rare in your hands. But sometimes you can barely find a stitch of information about a book, and Google becomes a nightmarish maze of half information, incomplete clues, endless circles and dead ends. 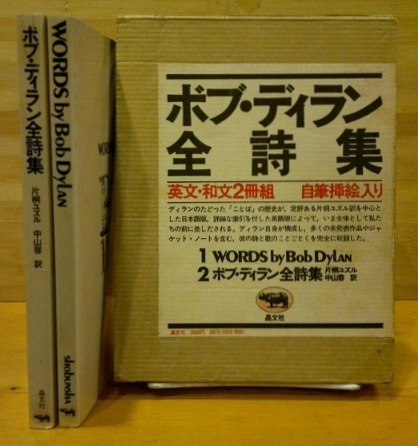 Take this book, for example: a bilingual, two-volume collection of the lyrics from Bob Dylan’s first ten albums, containing the English lyrics in one volume and Japanese translations of them in the other. It’s on WorldCat.org. And that’s about it, in English at least. But you follow a breadcrumb here to a Japanese fan page there, and you surmise that a certain set of kanji must be the title, so you work with that for a while (even though you don’t know any Japanese and you’re not even sure it’s right to call those kanji), then you chucklingly puzzle your way through Google Translate versions of a dozen or so pages, where you discover that apparently the kanji for “Bob Dylan” is transliterated back to English as “Bobu Diran”… And eventually you get an idea of how rare the book is. However difficult it is to track down, though, it’s a neat book, so we thought you might like some pictures. The free endpapers of each volume look like typewritten pages of the English lyrics, and each volume has its own design elements. 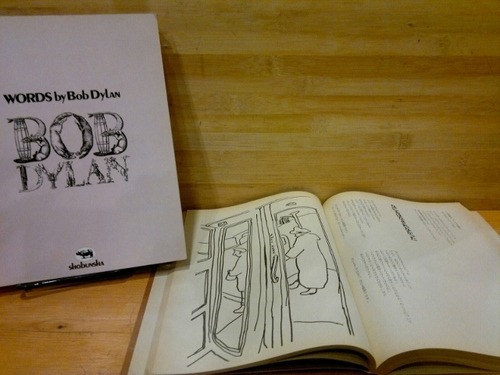 The Japanese volume has Dylan’s line drawings scattered throughout. 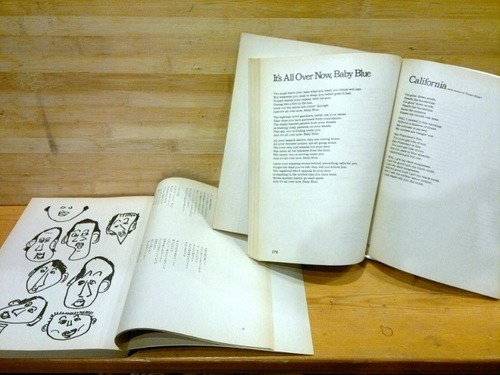 The English volume has contrasting page designs with tracklists between each set of lyrics, and some sections also include writings not from the album itself, such as early versions of songs or other—I assume contemporaneous—poems. Curios is a periodic series about an interesting used book; rare or common, expensive or cheap, we hope it’s a book you didn’t know you were looking for.